Once again, I was lured by the Siren’s song of the farmers’ market. I picked up some lettuce, some carrots, some cipolline onions. But what caught my eye this week was the box of baby beets. 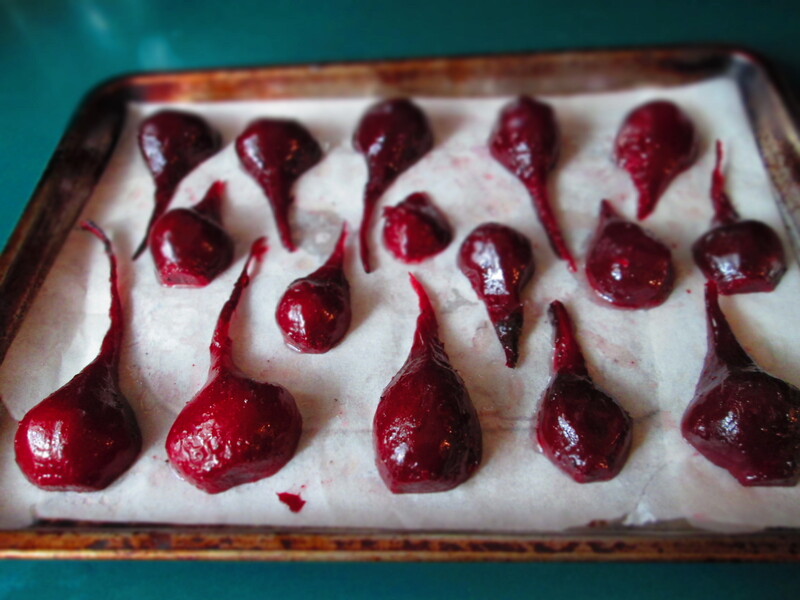 Gigantic red globes can be found anywhere, but baby beets are not quite as easily found. At least not for me. So I pounced on them. When I was doing my internship at the James Beard House, I worked with different chefs each week. One week, I worked with the crew from Blackberry Farm in North Carolina. 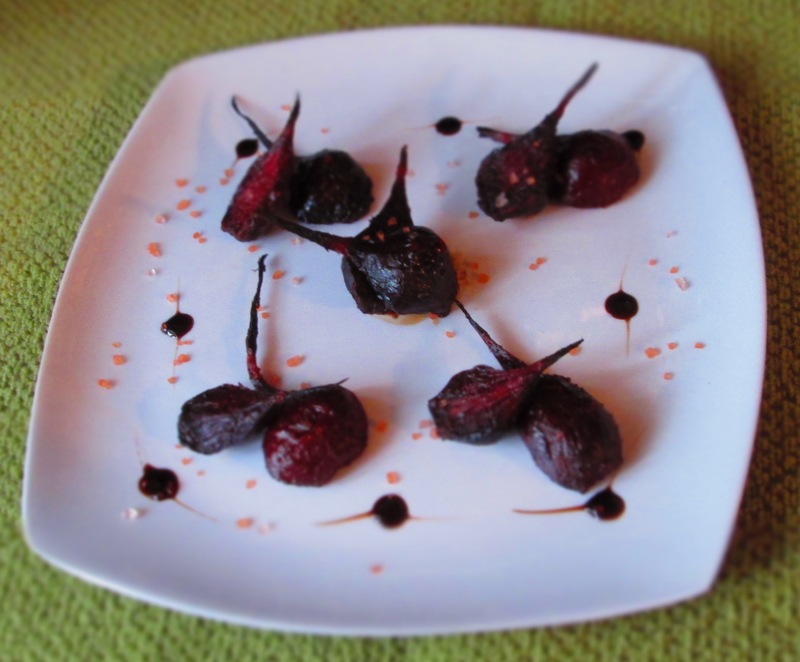 They did a plate of roasted baby beets that were like sparkling jewels. And the memory of those little gems is what inspired me to make this recipe. 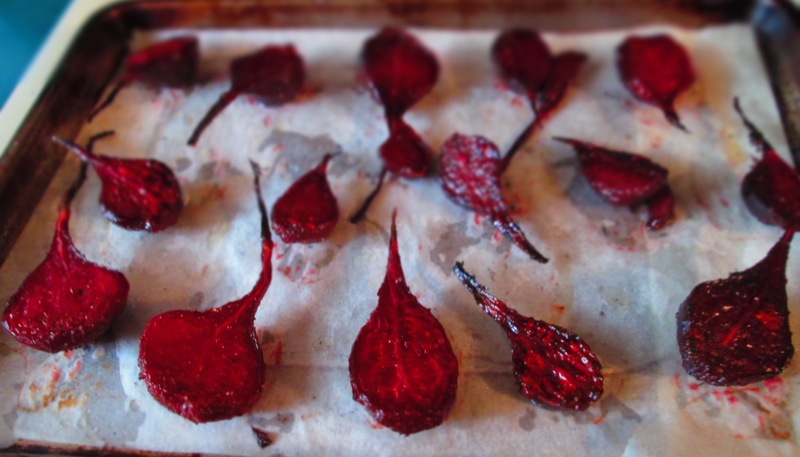 First, I roasted the beets, then cut them in half, and roasted them again to caramelize them. I made a balsamic reduction and used that as a dressing. Finally I finished the dish off with a sprinkling of Hawaiian pink sea salt. I made these on a Sunday, and all day long, I kept grabbing one and popping it into my mouth. My intention was to save some for dinner later and the next day, but they didn’t make it. The tray was gone by dinner time. They were just that good. 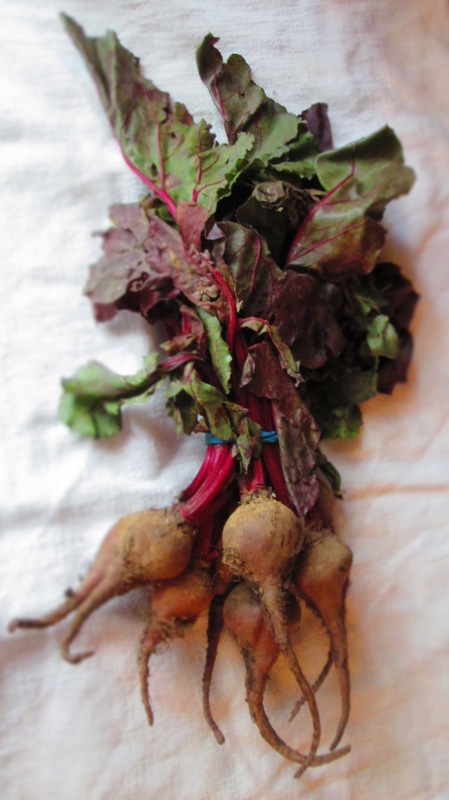 I hope you can find some baby beets at your local farmers’ market—or any market—and give this a try. Preheat the oven to 375 degrees F. Line a baking sheet with parchment paper or aluminum foil and set aside. Remove the leaves and stems from the beets. (Reserve the leaves for other purposes!) Wash the beets and let them dry. Wrap them in a piece of foil and place the packet on a small baking sheet. Bake for about 20 to 30 minutes. Open the packet and let them cool until you can handle them. Peel the beets and cut them in half. 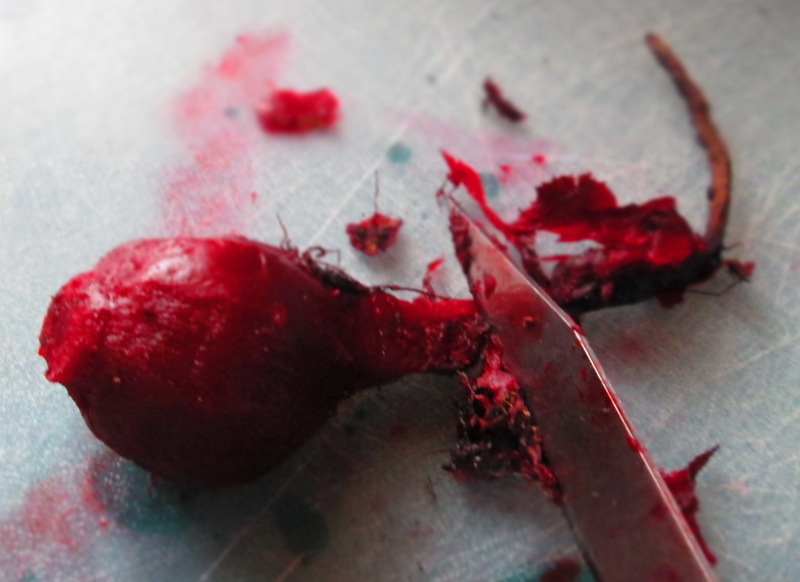 For a nice presentation, if the beets have a long root, leave it intact and slit it when you halve each beet. You can peel the roots by gently scraping them with a paring knife. 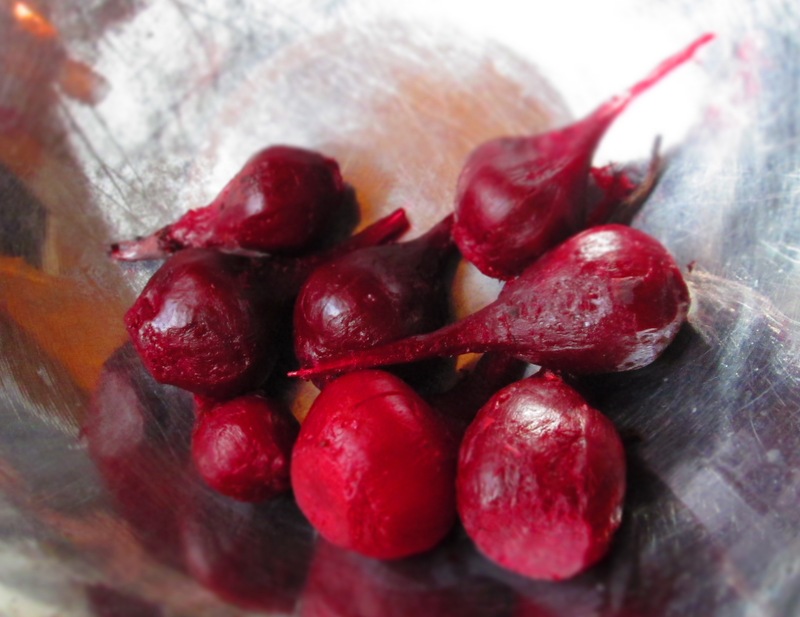 Place the beets in a bowl and mix with the olive oil and salt and pepper. 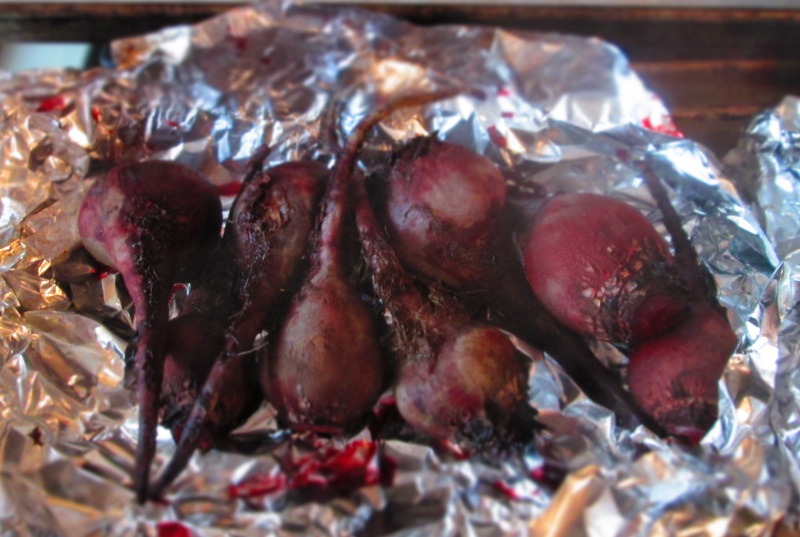 Return the beets to the baking sheet, cut-side down, and roast another 15, uncovered, until they brown underneath. Turn them over and roast them another 5 minutes. 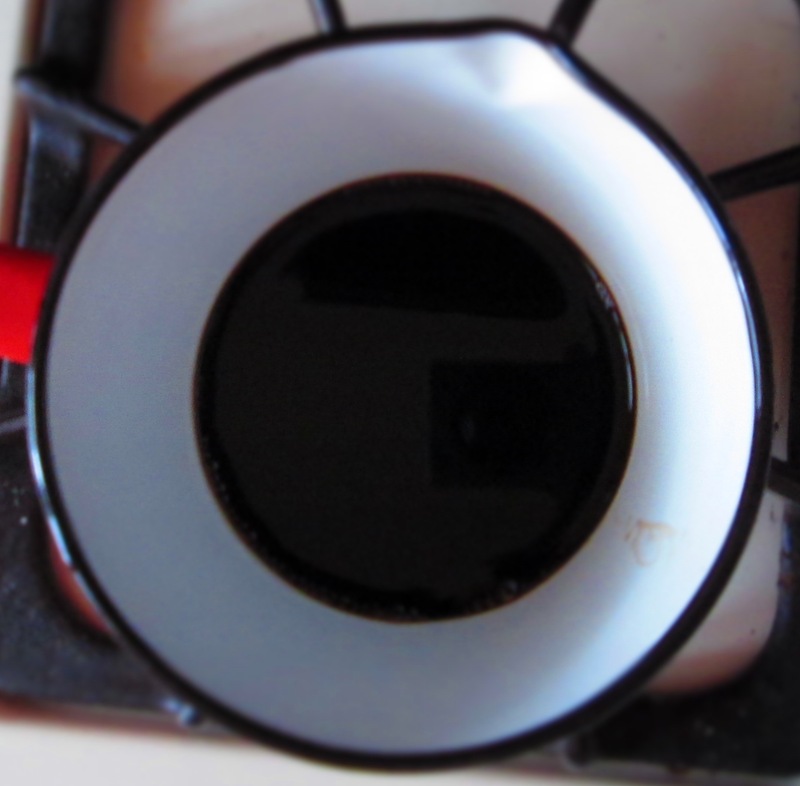 In a small pan, heat the balsamic vinegar to simmering. Continue simmering over low heat until it’s thick. Keep an eye on it, as it can easily go from “not yet” to burned goop. 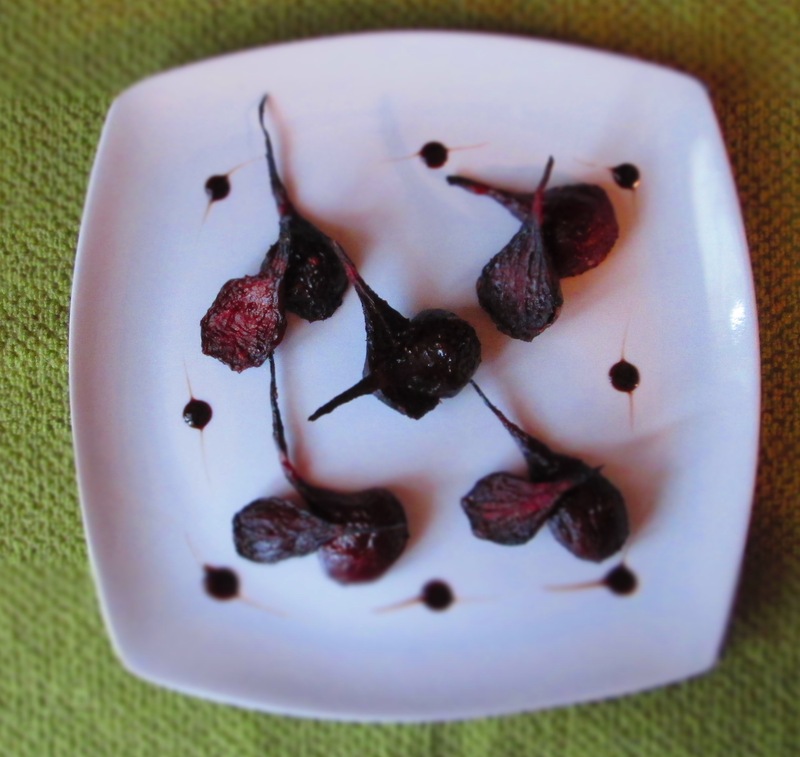 Transfer the beets to a platter and drizzle the balsamic and extra virgin olive oil over them. For taste and texture, I also sprinkled on some Hawaiian pink sea salt. Categories: Gluten-free, Healthy eating, Recipes, Savory Cooking, Uncategorized, Vegan, Vegetables, Vegetarian | Tags: beets, farmers' market, roasting, vegan, vegetables, vegetarian | Permalink.